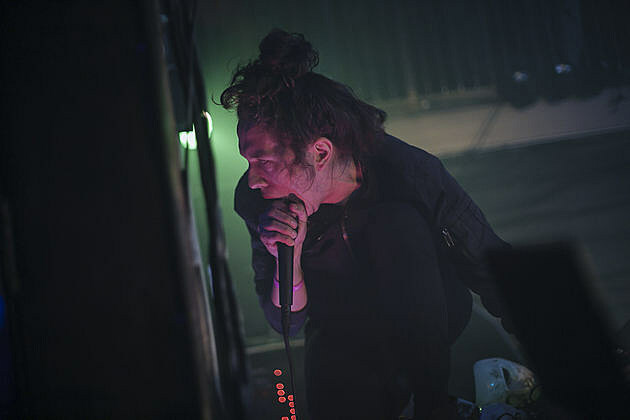 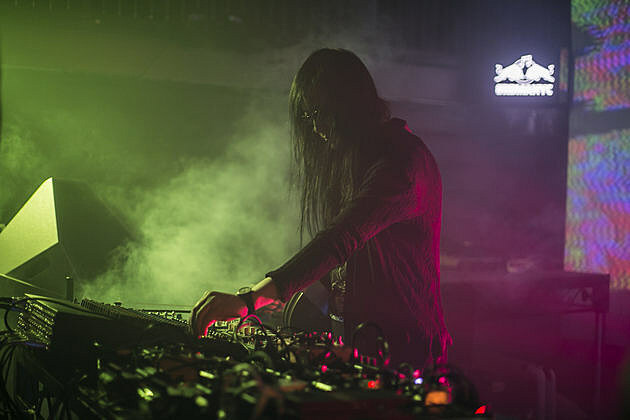 Nothing Changes, the weekly NYC late-night darkwave-noise-avant-etc party that usually happens at LES club Home Sweet Home, moved into fancier digs this week, a one-time-only special edition at Williamsburg danceclub Output on Wednesday (5/13) as part of the 2015 Red Bull Music Academy. 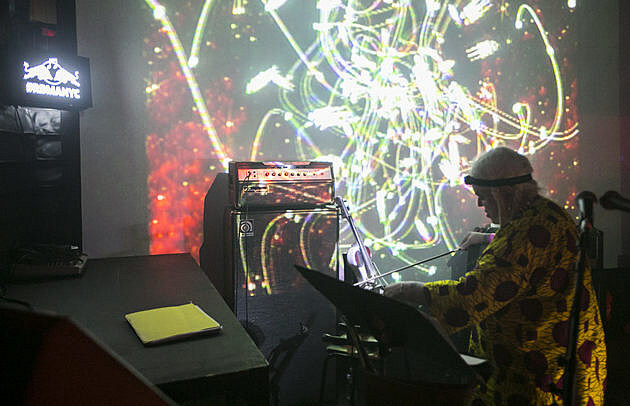 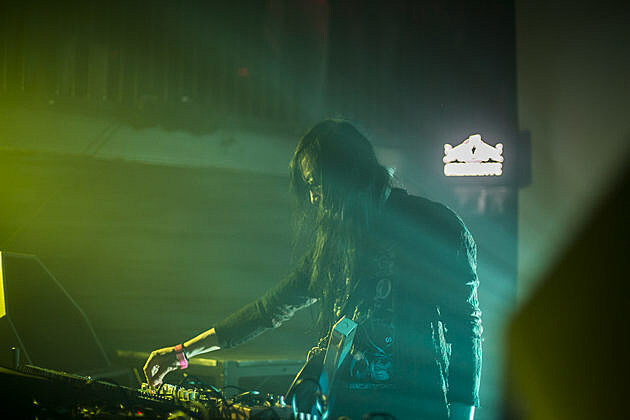 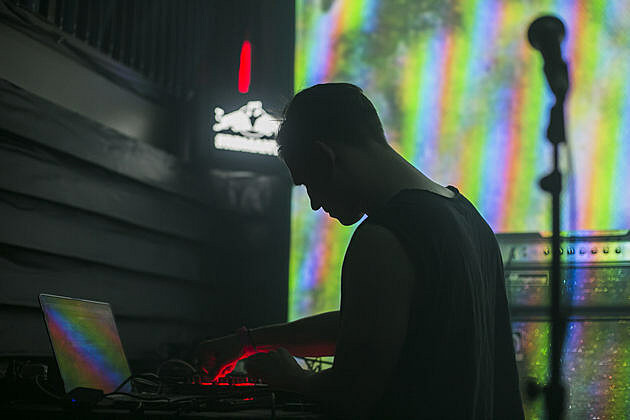 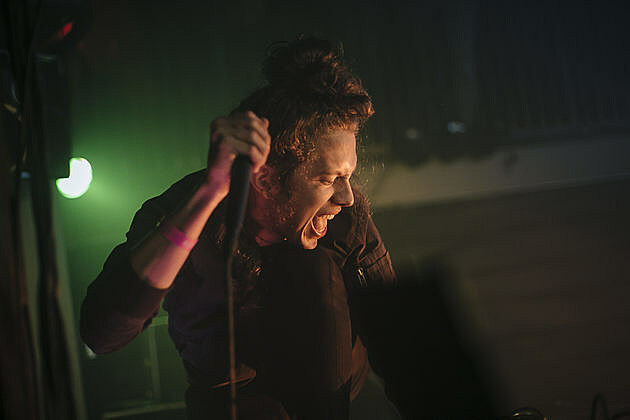 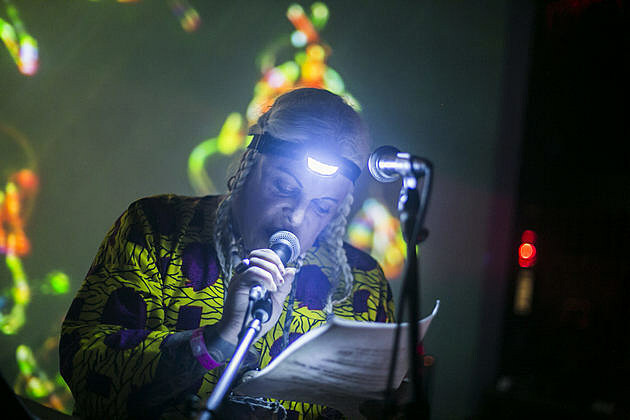 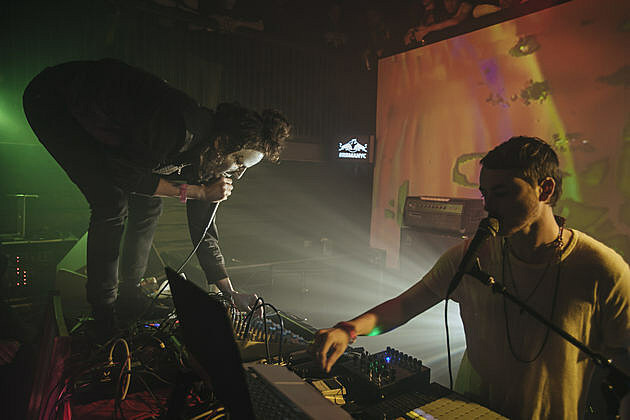 This was RBMA’s noise show for this year and featured a pretty stellar lineup, including Uniform, Pharmakon, Prurient, Genesis P-Orridge & Aaron Dilloway, Merzbow, and Marshstepper in the main room, and sets from Ron Morelli, Becka Diamond, JR Nelson & Ciarra Black, Jock Club, and Scott Mou in Output’s Panther Room. 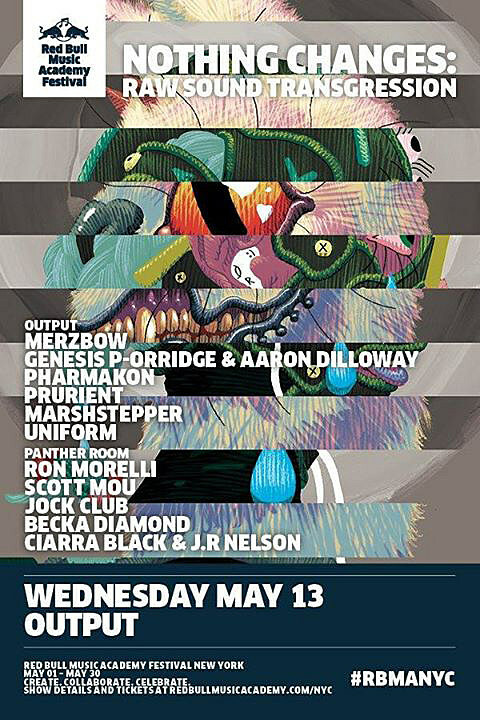 This was my first time at Output but I’m guessing this was not its normal crowd. 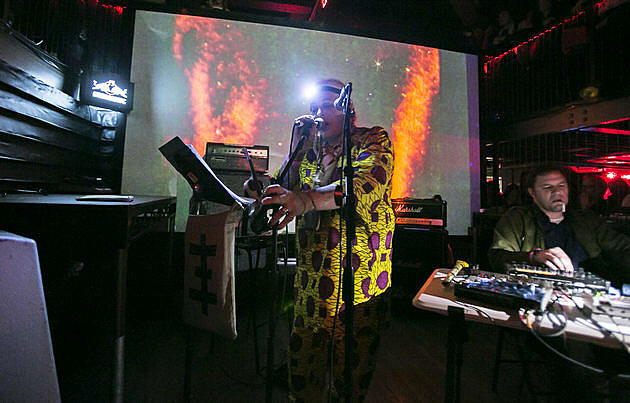 Output doesn’t normally have live music inside, but their famously killer/expensive soundsystem (which can be really loud without being painful) really gives this kind of droning/noise all-enveloping power. 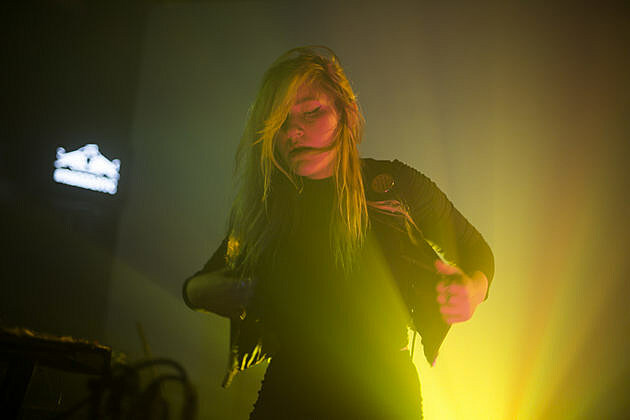 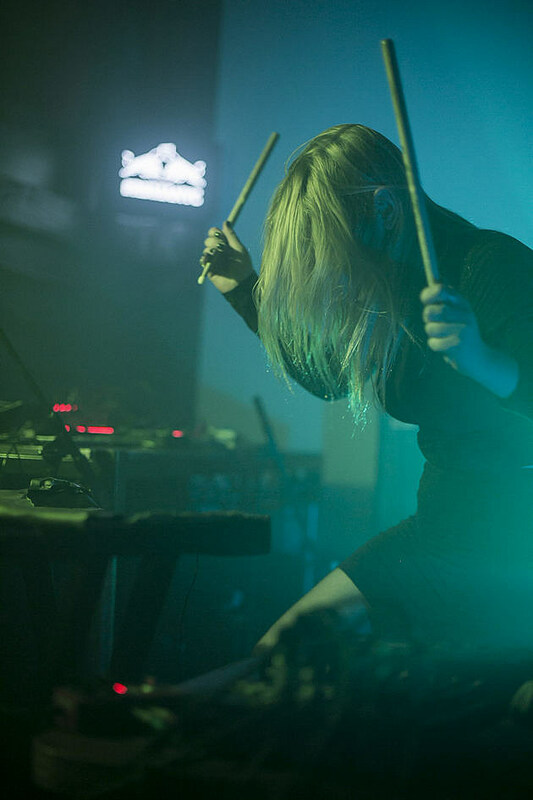 I got there right as Pharmakon had started her set. 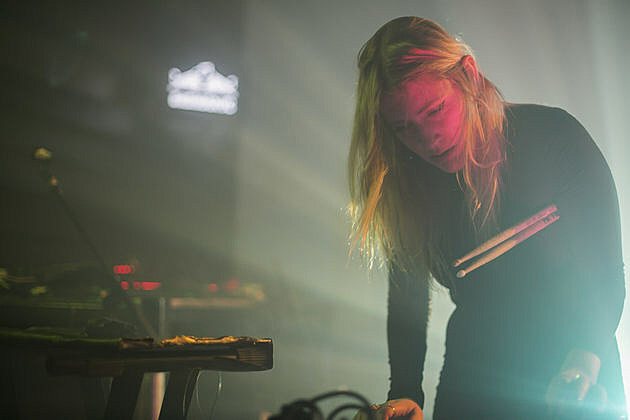 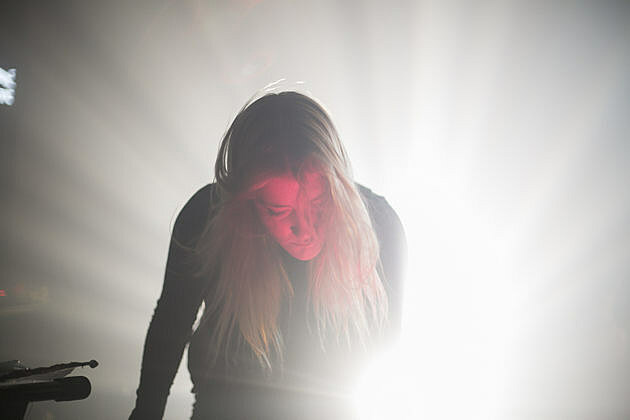 Having just come from watching a screening of the Twin Peaks season 2 finale, straight to seeing Pharmakon writhing on the floor, screaming over dissonant electronics and strobes, the line between where one ended and the other began was a little blurry. 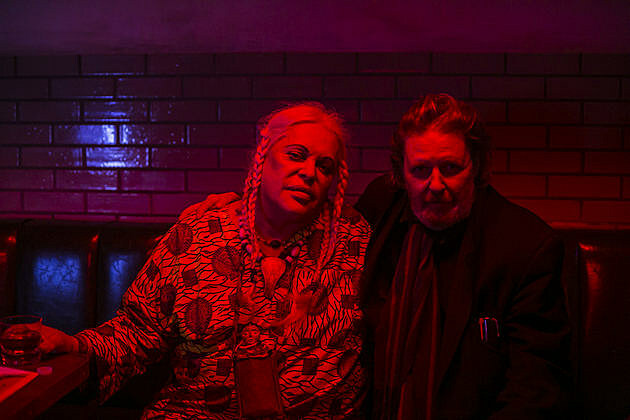 If the Black Lodge has a dance club, it’d probably be something like Nothing Changes. 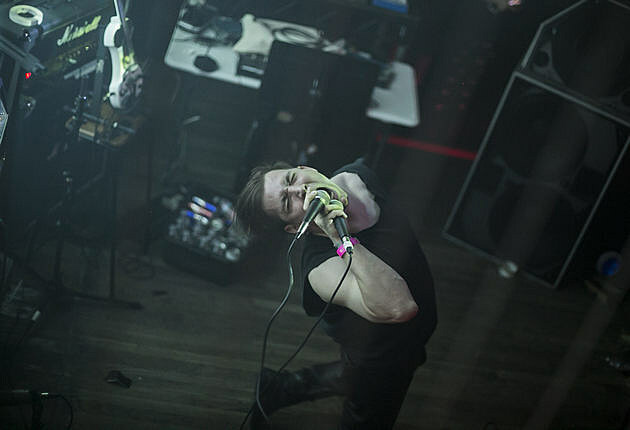 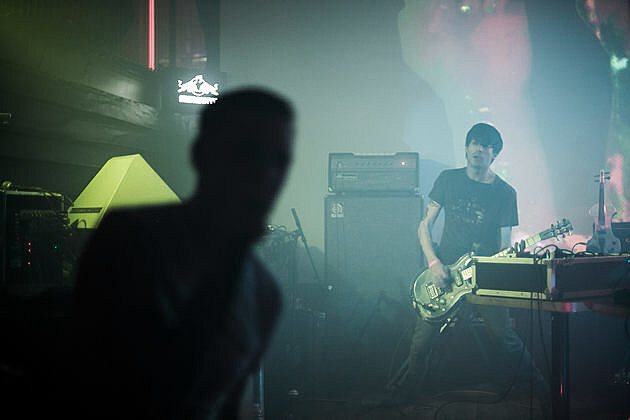 Prurient’s set, heavy on the sub-frequency drones, worked especially well with Output’s soundsystem, which has the kind of bass you feel in your bones and could pulverize a kidney stone. 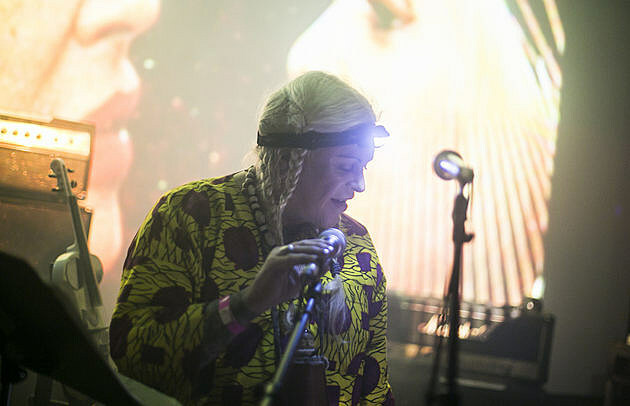 While things kicked off around 10 PM, earlier than your average night at Nothing Changes, it went just as late and had this working man heading home around 1:15 AM…which was about 10 minutes into Genesis P-Orridge & Aaron Dilloway’s (Wolf Eyes) set which leaned more towards Throbbing Gristle than PTV. 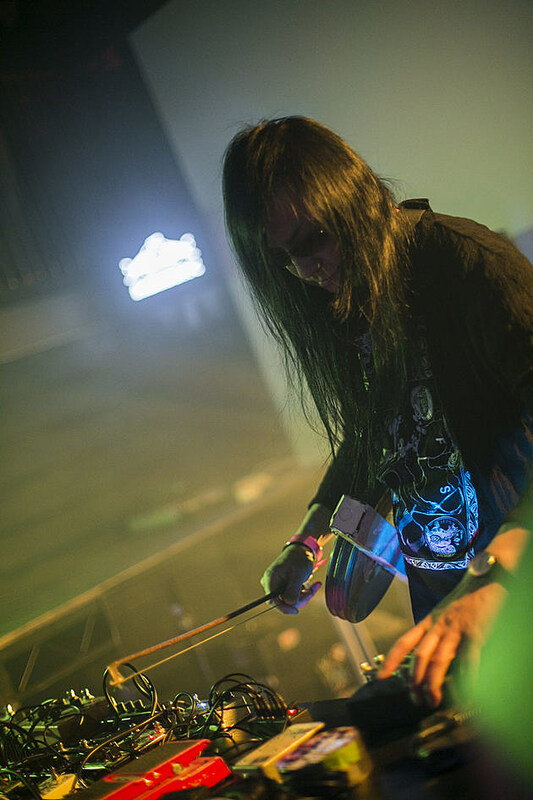 So I missed Merzbow and what looks to have been a very typically bizarre set for Marshstepper, entirely. 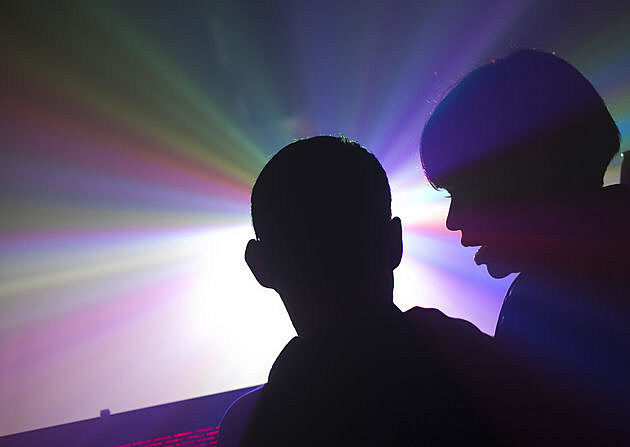 But pictures from their sets, and everyone’s in the main room, are in this post.